The battery is the heart of any DC-based electrical system. Every battery requires proper use and care, and it is important to understand their operational and safety characteristics. The Solar Stik System is engineered to work with nearly any 12 V or 24 V battery technology, both lead-acid and lithium-ion battery chemistries. Lithium batteries are used for high-performance applications where it is critical to keep weight down and to maximize energy density, while lead-acid batteries provide low-risk solutions needed by many users. When a battery is used as the primary source of energy for a load, energy only flows from it in direct proportion to the power that is required to support the load. This catapults the entire circuit into a high-efficiency model. It opens the architecture of the circuit to allow for the use of multiple power generation sources and technologies that directly support the application. It allows for multiple levels of control so operators can address specific application requirements (e.g., silent runtime). In a high-efficiency electrical circuit, all functions revolve around the battery, and control over the entire circuit can be exercised using a single value—the battery state of charge (SOC). The battery becomes the heart of the entire electrical circuit. 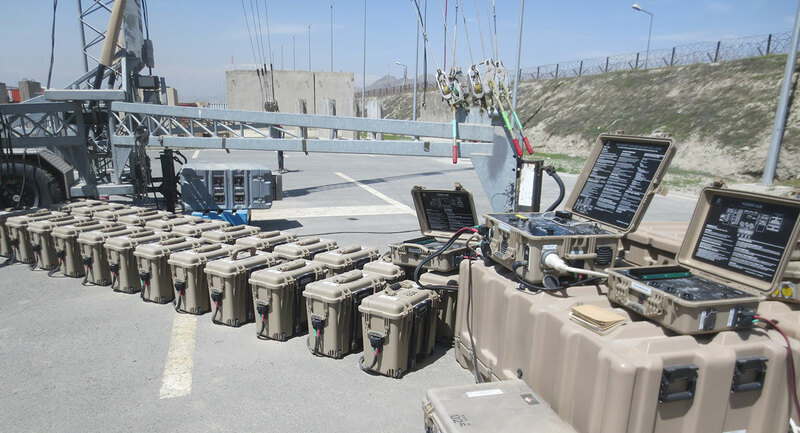 Two rows of 12 Lead-acid Expander Paks are set at the base of an intelligence, surveillance, and reconnaissance (ISR) tower. Each row of Expander Paks is part of two separate Solar Stik Hybrid Power Systems being tested and readied for field deployment. A battery converts stored chemical energy into electrical energy via a chemical reaction . Battery cells are the most basic individual components of a battery. Each cell produces a certain voltage known as electromotive force. To make what we visualize when we think of a battery, individual cells are placed together in a single case and connected in series to provide the cumulative voltage (for example 12 V, 24 V, or 48 V). The voltage rating of a battery is directly related to the number of cells that have been wired in series. The voltage of each cell varies somewhat between brands, as each manufacturer uses a slightly different chemistry. A battery cell is a container in which electrolyte and lead plates can interact. The electrolyte is usually a solution made up of 35% sulfuric acid and 65% water. The lead plates are treated with lead oxide and powdered sulfates to give them their positive and negative properties. When the positive and negative lead plates are submerged in the battery’s electrolyte, a chemical reaction occurs. This reaction causes electrons to flow between the lead plates. The negative lead plate builds up an excess of electrons in a process called oxidation. This causes an electrical difference between the negative plate and positive plate. The extra electrons on the negative lead plate want to displace the electrons on the positive plate in a process called reduction. However, the electrolyte solution of sulfuric acid and water ensures the electrons cannot travel directly to the positive plate. When the circuit is closed (with the help of a “conductive path”, or load, between the negative and positive plates), the electrons are able to travel to the positive plate. This, in turn, provides power to any appliance placed along the path. This electrochemical process can be summarized as a reversible transfer of sulfate between the water and the lead plates during charging and discharging. As the battery is discharged, sulfate in the solution combines chemically with the lead plates of the battery to form lead sulfate. As the plates accumulate this sulfate, the electrolyte solution becomes more like water and less like sulfuric acid. The reverse occurs as the battery is charged. As charging current flows into the battery, the battery plates revert back to their original condition and the electrolyte reverts back to its original sulfuric acid content. The exact chemistry is often patented and proprietary to each battery maker. When a charge is applied to a lithium-ion battery, electrons flow between the internal components. The basis of this reaction is the lithium metal binding and unbinding with the other chemicals in the electrodes at the ionic level. As power is drawn out of the battery, the metal moves from one electrode to the other, and when the battery is charged, it moves back to the original state. The metallic lithium ions literally move through the separator material. The capacity of a battery is the amount of energy it can store. 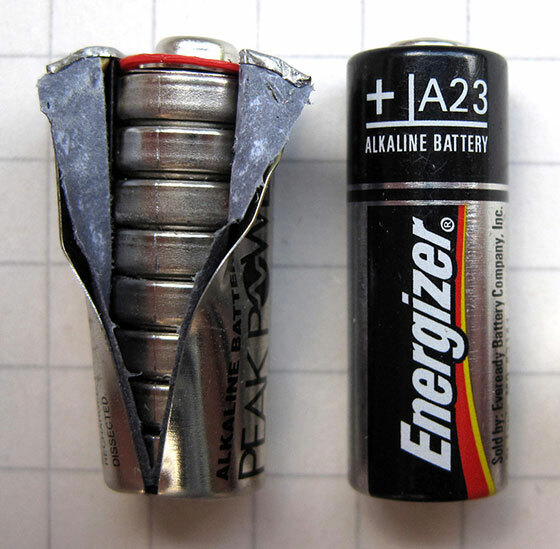 Often capacity is given in amp hours (Ah)—the amount of current measured in amps a battery can provide over a period of one hour before rendering the battery discharged. However, using watt hours (Wh) is a direct measure of energy capacity. Watt hours is especially useful when talking about energy density of a battery. Energy density is a measure of battery capacity (watt hours) divided by how much the battery weighs in kilograms (Wh/kg). For typical 12-volt batteries, the amp hour rating (capacity) is determined at what is called a “20-hour rate”. This describes the total amount of current that can be consumed from the battery before causing the battery’s voltage to drop to 10.50 V over the course of 20 hours. For example, a 105 amp hour (Ah) battery can deliver 5.25 A for 20 hours before the battery voltage drops to 10.50 V, at which point the battery is considered depleted. The same battery will also deliver approximately 10.50 A for 10 hours, and so on. The formulas for determining the power available in a battery are not concrete. The actual amp hours available from a particular battery will be somewhat higher if less current is delivered over a longer period, and somewhat lower if more current is delivered over a shorter period. This is due to the slightly higher energy loss as a battery is discharged more quickly. A cycle is one complete discharge and recharge of a battery. 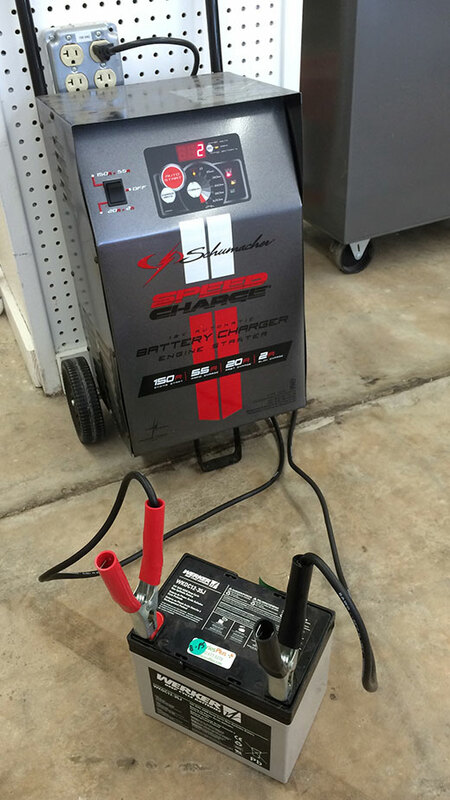 The cycle life of a battery is the cumulative number of charge and discharge cycles a battery can provide. Cycle life will range in value based on the chemistry of the cells and the conditions the battery is subjected to. Exactly how many cycles a battery can be expected to provide can be referenced from the battery’s technical specifications comparing depth of discharge and cycle life. Other abuses include subjecting batteries to temperature extremes and improper charging, which vary depending on battery chemistry. A battery is functionally dead when it can no longer hold a proper charge, or when the available battery capacity is unacceptably less than the original battery rating.